This case study is part of a series of reports that presents the current requirements of Thai – based companies as they drive up investments in datacenters and various services components for colocation and managed services. The case study presented in this document shows the capability of TCC Technology (TCCtech) to respond to the high requirements of a multinational insurance institution with an aim to significantly transform its business as well as internal processes. The case study represents a company that noticeably drives the robust demand for data centers and managed services in Thai market. It would however be useful to first cite a trend of data center services that contextualize such demand and thus drive companies to consider TCCtech’s offerings. Thailand 4.0 implications. Following the formation of the ASEAN Economic Community (AEC), Thailand has become the logical business hub for neighboring economies such as Cambodia, Myanmar, Laos, and Vietnam. To drive economic growth, the government has initiated Thailand 4.0 with an aim to move the country forward by reforming the economic structure and enhancing the country’s competitiveness in the digital era. The government has committed to comprehensively open the market to a greater number of emerging players and promote greater technological development in various industries. This liberalization is seen to improve the efficiency and competitiveness of various industries in their respective jurisdictions. The convergence of actions by governments to liberalize and the effort by institutions to make good on market entry strategies will lead to a trend of institutions quickly expanding their presence — with branches, outlets, subsidiaries, operating units, and partnerships — in these new markets. We expect that moving forward, investments in datacenters by Thai companies will have such national and regional implications. Growth in the digital channel. The mobile channel has increasingly become an important mode of engagement as the customer can now own, manage, and control the channel through a device in his/her hand. Companies must now engage with the customer under the customer’s own terms. Customers are demanding instantaneous response and better user experience in their interactions with companies; this means that companies have to give them the appropriate response at the point of contact as quickly as possible. Latency, uptime, availability, reliability, and user-intuitiveness are the most relevant technology imperatives for Thai companies as they support increasingly digital-interacting customers — not to mention the capability of these companies to support the sheer growth in transactions. The push for digital transformation (DX). Digital transformation has been a key theme for institutions to drive change in their business models and ecosystems by leveraging digital competencies. Within the current period of economic revival, IT departments continue to look for technology tools and new innovative solutions — such as mobility, big data and analytics, cloud, and so forth — to help them transform their business. As the institutions move toward digitalization, there will be more data and information to store, process, and manage. These institutions will need to manage all their technology assets, including their datacenters, more efficiently. Datacenter modernization can have many benefits such as better cost management, improved staff productivity, clearer paths to upgrades, and a more thorough approach to maintenance. Datacenter modernization is therefore not a matter of if, but when. The datacenter is the backbone of information management in organizations. The maturation of technologies supporting datacenters means that, to an increasing degree, customers are choosing how to deploy and use this fundamental asset. Some datacenters are managed privately on-premise, while some are outsourced to a third party. There is also cloud infrastructure as a service (IaaS) alternatives, although some institutions admit to still being wary of having its data offsite on the cloud. Meanwhile, datacenter outsourcing is a growing trend all over the world, including in Thailand. 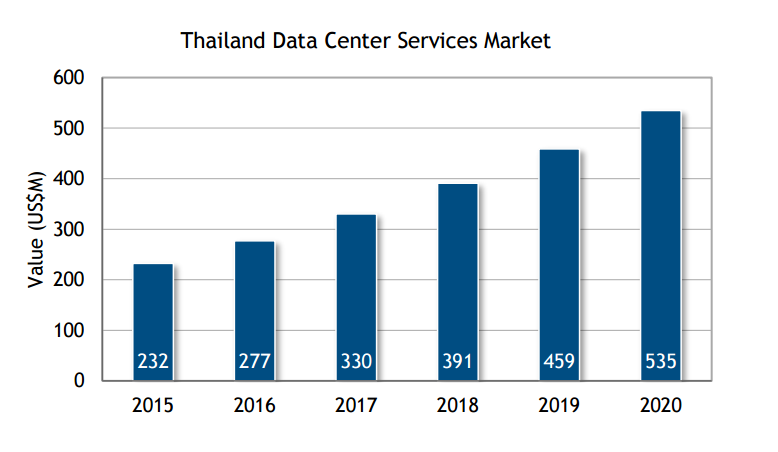 IDC Thailand estimates that the datacenter services market — which includes hosting infrastructure services, hosted application management, and network and endpoint outsourcing services — is growing at a fast pace at a compound annual growth rate (CAGR) of over 18% from 2015 to 2020 (see figure below). AIA Thailand has been operating in Thailand for 79 years since 1938 and is a member of the AIA Group, the largest independent publicly listed pan-Asian life insurance group. Headquartered in Hong Kong, AIA Group has a presence in 17 other markets across the Asia-Pacific region. The company serves more than 5.5 million Thais with over 8 million policies with life insurance, savings and retirement solutions, and accident and health solutions as well as over 1.8 million corporate members with corporate solutions including group insurance, credit life insurance, and provident funds. AIA Thailand is going against the common perception that insurance is an industry that is slow to change. Its many recent initiatives show AIA’s intentions to strive to creatively transform its business and provide a better user experience. AIA Thailand’s changes are innovation and digital transformation – seen in many initiatives from the back office to customer-facing interactions. In some appropriate back-office operations, AIA aims to push the system and applications to public cloud, subject to the standards and security. It has initiatives for office and agent productivity as well. To enhance user experience for both customers and sales agents, its primary workforce, AIA developed mobile applications. Here, AIA iService and AIA Vitality Thailand stand out. The company developed AIA iService to allow customers to check their policy, premium, coverage, and claim policy through a smartphone. To an extent, this mobile application has rendered the insurance application process paperless. The company also offered a new customer experience in 2016 with another mobile application called AIA Vitality Thailand, a science-backed wellness program that works with customers and rewards them for the healthy choices they make. The application integrates insurance products that offer an insurance premium discount to customers engaging in healthy activities such as working out at the gym and tracking the number of steps walked during the day. The concept is that customers can save money with cashbacks and discounts as they get healthier. For AIA Thailand, agents are crucial as the company started from and grew through sheer agent force. The company, therefore, focuses keenly on agent experience. AIA has enhanced its agent experience through interactive point of sale (iPOS+) by using iPad sales suite that includes financial needs analysis with an ability to obtain quotations, complete applications with electronic signatures, and make payments. iPOS+ allows the application to be processed automatically and directly into the business process management (BPM) system. This has reduced work processes, improved time-toquote metrics, and significantly enhanced agent experience and efficiency. AIA Thailand has also seen changes to its core infrastructure. At a groupwide level, AIA has, since 2016, aimed to complete a plan for the transition and transformation of IT operations in all its country operations. For Thailand, scaling up and modernizing datacenter operations were among the priorities, with AIA Thailand having run its on-premise datacenter for over 25 years. Following the group’s transition plan, the company considered all options available: to upgrade and modernize, to build a new site, to outsource, and all other permutations thereof. However, the legacy datacenter housed in the company’s building posed limitations to renovate and upgrade to current industry standards. Constructing a new site was simply not practical since it would not be cost-effective and would be time-consuming. “The best way is to outsource it, of course. This is the trend in the world, ” explained Kitti Manakongtreecheep, CTO of AIA Thailand. There were two main considerations for AIA Thailand in choosing a colocation provider. First, the datacenter must be in Thailand. Under Thai law, two guidelines are of particular primacy in considering how to manage Thai citizens’ information: the Credit Information Business Act B.E. 2545 (A.D. 2002) and the National Health Security Act B.E. 2545 (A.D. 2002). The Health Security Act is of interest to AIA, given that it holds health information of its customers — a unique case for insurance and beyond the health sector, of course. AIA Thailand’s best option was to engage a local provider for colocation infrastructure services. TCCtech and its three datacenter locations were seen as strategic and reliable. One site scored well against AIA Group’s requirements as well as AIA Thailand’s assessment and, thus, was selected to be AIA Thailand’s secondary site for its active/standby failover. In case the primary site goes down, AIA Thailand’s applications will be initiated at the secondary site within 15 minutes to 4 hours, depending on the priority of each application. In this aspect, Kitti regards TCCtech services as of high standard, citing reliability and resiliency metrics. Moving forward, AIA Thailand is seen to rely more on cloud and datacenter services. The company is looking to transform even more in 2017 with a plan to select TCCtech for its considerable experience in high-quality datacenter for more redundancy and resiliency. The company’s data will be replicated to the primary site following extensive system testing. Overall, the story is this: TCCtech infrastructure services allow AIA Thailand to focus on its core business, developing better service for the customers and improving operational efficiency with better user experience both externally and internally. The colocation service and further transformation of its IT assets will enable the company to control costs and raise the standards for reliability, resiliency, and availability of critical infrastructure. As the market is now more knowledgeable about solution offerings for datacenter services, companies are recognizing now more than ever that outsourcing is an alternative for in-house datacenter operations. Outsourcing provides the benefits of cost and asset optimization and increasing work process efficiency. This will be the future for more and more companies in the Thai market. Although related issues such as security, performance, the high cost of connectivity, latency, service provisioning, and actual cost of rollouts have been significantly improved in recent years, the market still expects the best service quality from datacenter service providers. TCCtech will ensure its continued growth as it can communicate such unique quality of services to the market with a strong and applicable demonstration. In the past few years, a surge of international players has been witnessed in Thailand. With the new players having different and distinguished service offerings, there will be more variety in the market. TCCtech views this as an opportunity for its market to grow further, although it will have to deal with the varying requirements of potential customers. Identifying use cases for each prospect company and prospect industry that TCCtech intends to serve will be crucial. TCCtech will be wise to thoroughly understand and be proactive about the context of each individual client. It now has a strong reference for the unique requirements of insurers: AIA Thailand will be its proof.